Legacy Foods has taken all of the necessary steps to ensure that the dehydrated and freeze dried meals will be fresh, healthy and full of flavor when you need them most. Forget about having to rotate your food storage! 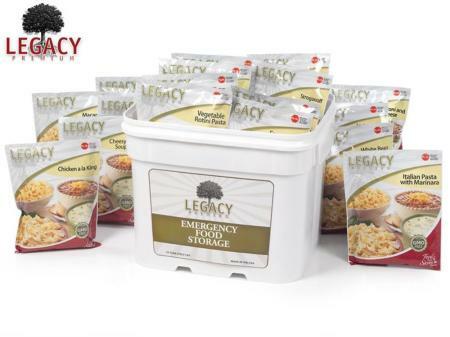 Legacy Premium Food Storage uses only the highest quality ingredients when making food and packaging to ensure that it will stand the test of time.Residual oxygen levels in the food are key to determining how long it will last. Extensive research and blind taste tests of ALL of the leading emergency food brands have resulted in a clear #1 leader – Legacy Premium Foods! Legacy was selected as the best tasting by 4 out of 5 consumers in the blind taste test research.Legacy Premium Foods has partnered with Honeyville, Inc. to provide incredible tasting food storage. Honeyville has been producing grocery quality food for over 50 years, and that shines through when you taste the flavors, variety and gourmet meals. Better yet, you will NEVER find GMO’s, MSG, canola oil, trans-fats or high fructose corn syrup in any of our products! FREE Domestic Shipping on ALL Legacy Orders – Any Order, Any Size!